Trying to work on way too many projects at one time and working around activities and travels. 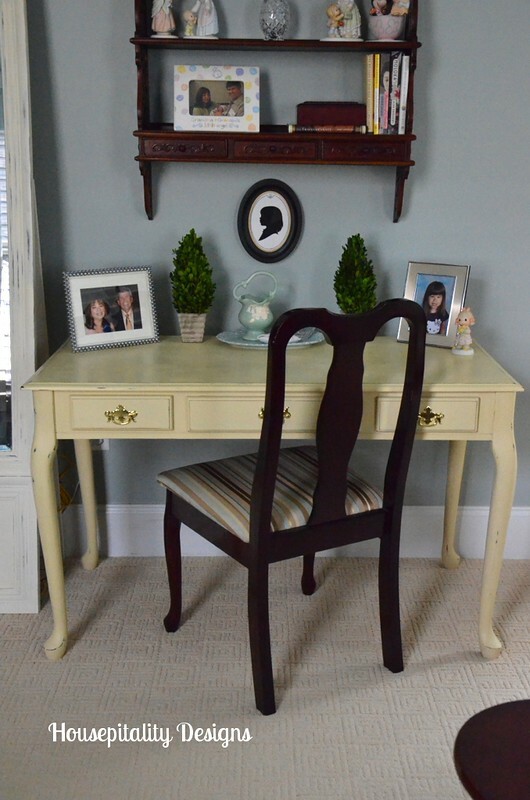 This week, I tackled my “bombayesque” desk. I want to break up all of the cherry finish in the room and add some color. 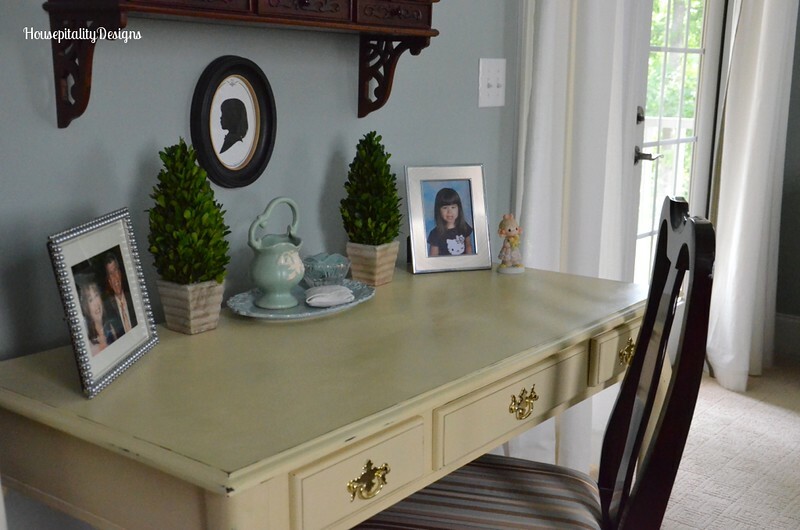 I painted the desk with Annie Sloan Chalk Paint in Cream. When all was said and done….my skeptical hubby that loves “matchy matchy”….loved it! Yes, “Mickie” loved it! Well, actually Tom loved it. The before…even with those ugly “M Cell” cords..now they are hidden! 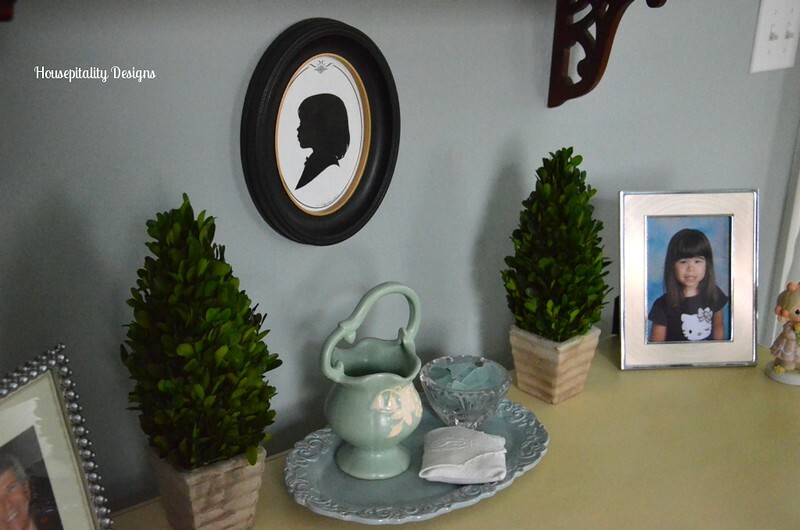 I am working on re-styling the shelf…I love my Precious Moments on it that were gifts from my son. So trying to work “sentimentality” with the correct design…but then again, we live with what we love. And the picture of her in her favorite Hello Kitty dress. And the picture of us at our 40th Class Reunion…yes, 40th. I dare not move that little Precious Moment next to her picture…as she checks to make sure it is always there! 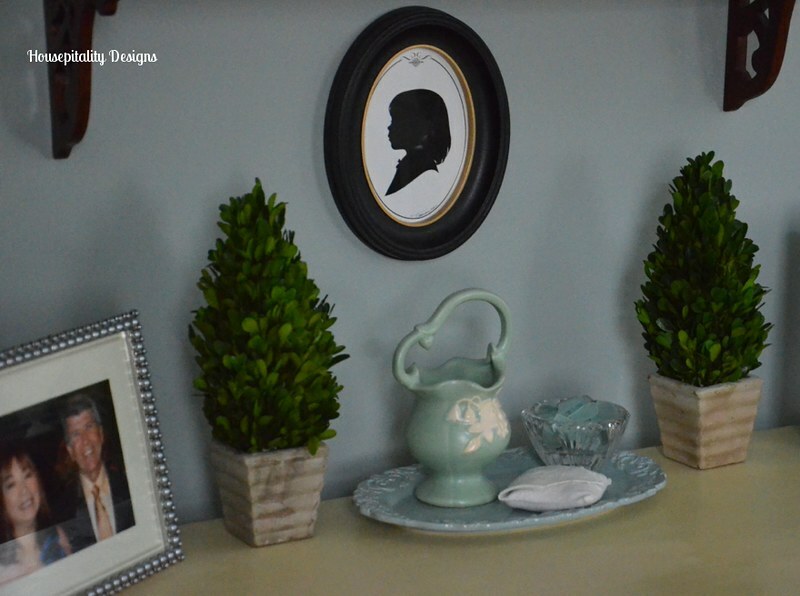 The colors in the room are of that shade with pops of yellow, white, and cream. I am happy with the results…and glad that my “matchy matchy” hubby is too! No, she will not be here!…only some of her beautiful things!! But who knows…you never know who be ringing the door bell…..maybe the Avon lady. Looks wonderful! How did you hide the cords? Need to hide some cords around my house. It turned out great, Shirley! I love the color. I think I’m going to have to see about getting a sample of that. What a great change and I love that silhouette of your granddaughter. So pretty. I think the story of her always checking on that Precious Moment being there is so adorable!! We have a matchy matchy bedroom. For some reason it’s never a priority to me…too many projects. Well done on the desk Shirley! I’m glad your husband approves. It looks great! I’m with you about living with what we love. My house if full of things that might not be considered “good design” but if it means something to me then I love it no matter what! It does look great! You are good at making over pieces. I don’t have the guts. I have learned recently that my hubby is much more comfortable with matchy matchy too! In the past it was my way too, which I’ve been working on! I think everyone should have some sentimental favorite things, otherwise who are we? Hi Shirley! How pretty. I love the contrast and the color is so soft and pretty. I’m really loving the darling little silhouette of your grand daughter. I need to do one of these. Your room is so pretty. i always love what you do and feel your home is beautiful AND remarkable. but here is my stab at displaying the precious moments…which absolutely should stay! place 3 on a pedestal under a cloche’ & the other alone with no pedestal on a small cloche’. paint your gran love’s (who is precious herself, btw) frame in some more annie sloan to match her favorite precious moment. and maybe the front doohickeys on the shelf could get a bit of gold rub and buff to further tie the whole thing together with the brass hardware…i keep all my brass hardware brass, too. 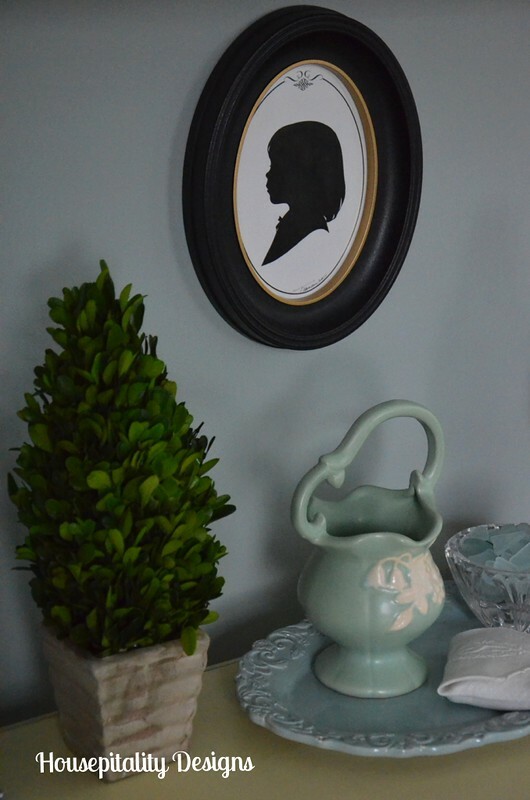 do you know if annie sloan paint can be used on a crib? How pretty Shirley, so calming and the colors are fantastic! Shirley, your bedroom is lovely! The new color is so serene! You always have the greatest ideas! You can NEVER move that silhouette! She is the most precious little girl. 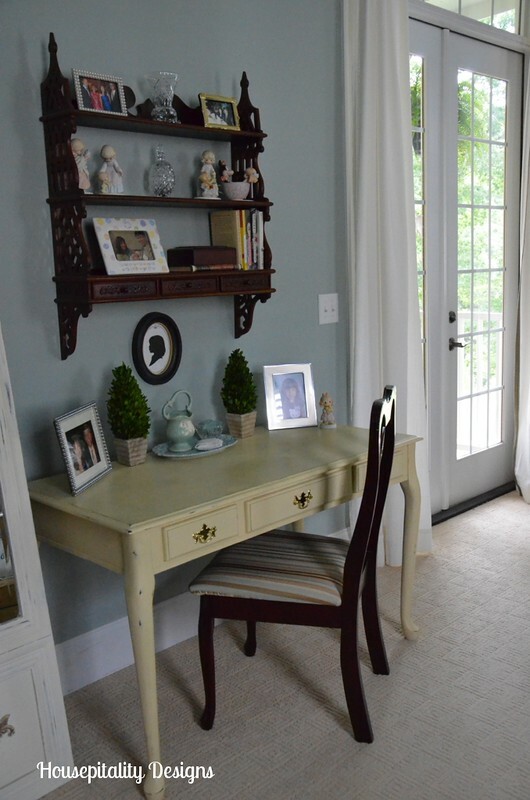 I love the desk painted, that color is so pretty! Great changes and I am glad your hubby is happy too. Looks great, Shirley. You know men…they love their wood. Glad that you were able to win Tom over. 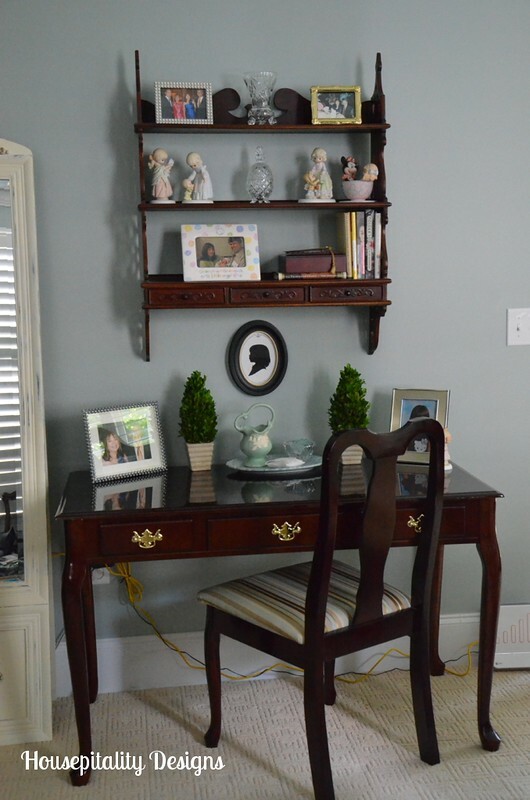 Now, you need to give a tutorial on your blog on hiding cords! Shirley, the desk looks great! I have a similar one in the guest room. The bedding colors are close to your Silvermist paint color, with hints of yellow in the throw pillows. I never even considered painting it…I may have to take a second look at that! The desk is beautiful, Shirley. I love the silhouette. We have one of Xanti, but the other g’kiddo’s haven’t had one done. We should do something about that! Shirley the desk looks terrific and I really like the color. My granddaughter always checks to see if the gifts she gives me are out. She is great picking out presents. Your bedroom looks really good and love the wall color. Awesome makeover Shirley…I love it! I think we have the same bed. Looks beautiful! That piece looks very expensive – you’re braver than me at painting it!!! 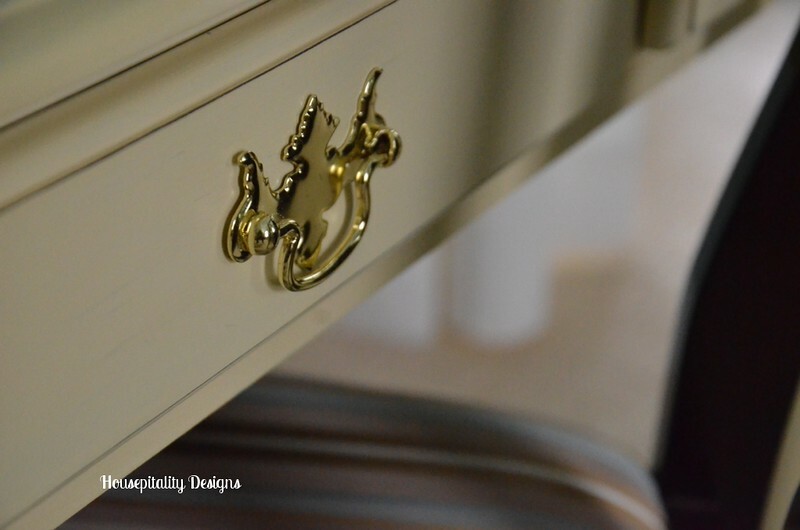 I really do love painted furniture though. Your desk looks great, Shirley! I really like that the “matchy-matchy” was broken up. I tried to get my husband to let me paint some of his (purchased in 80’s with first wife) Ethan Allen cherry dining room suite but he wouldn’t let me because he “paid good money for it”. I was glad when his son got married and his wife was happy to have it in their first home. I love the painted desk. I prefer a mixture of finishes to matching finishes, I think it adds so much more interest to a room and it makes everything look more current. I also loved how you styled everything. It is always nice when our family members like what we have done, makes things a lot nicer. what a transformation!! love that color! That was some makeover. It looks great. I am loving the color of your walls. A little similar to my bedroom walls. I like serene colors in the bedrooms. I love the little granddaughter keeping you strait on the Precious Moment’s placement. Too cute. Savannah Granny’s recent post…I’LL HAVE LEMON, PLEASE!